Applications: Trizact 337DC has a higher stock removal capacity than 237AA. This enables fewer stages to be used to achieve bright finishes quickly. They are highly effective on stainless steel and harder alloys (not titanium). Product Notes: Trizact is a structured grain abrasive giving highly consistent finishing performance. It has rapid stock removal characteristics which means you can use a finer grade than you might with conventional abrasives and still achieve a high stock removal rate, but with a fine finish achieved much more quickly. Trizact 337DC is normally supplied in grades up to A45 (P400), which may suffice for many brushed finish applications such as hand-rails. 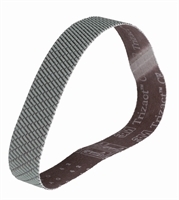 Also Available: For even finer finishes, we recommend Trizact 237AA belts.